The Space Foundation is holding a by-invitation gathering of some of the most innovative, insightful and visionary professionals from the entrepreneurial and investment sectors of space and technology. 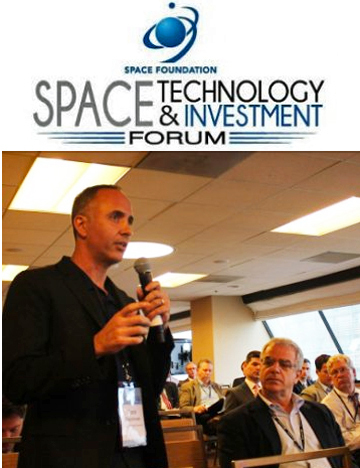 Hear and meet more than 40 speakers at the Space Technology & Investment Forum 2016, to be held August 16 & 17 at JW Marriott, San Francisco Union Square. "Remote Sensing, an Investment Hotbed"
"Closing the Deal - Funding Success Stories"
"Hard Problems and Space Solutions"
"Hot Niches and Why They're Hot"
"Impacts of the Legal and Regulatory Environment"
"Not-So-Strange Bedfellows: Where Investors and Government Funding Meet"
"Knowing Your Investor: Differences in Investment Goals and Approaches"
Participating companies include investors and innovators. Space is limited for the Space Technology & Investment Forum. See the complete speakers list at http://www.spacetechforum.com, and request an invitation at STIF@SpaceFoundation.org. Co-sponsorship of the Space Technology & Investment Forum 2016 is provided by CASIS, Illuminate and Lockheed Martin. Satellite Finance is the the media partner. Supporting organizations include Silicon Valley Space Business Roundtable (SVSBR) and Space Angels Network.